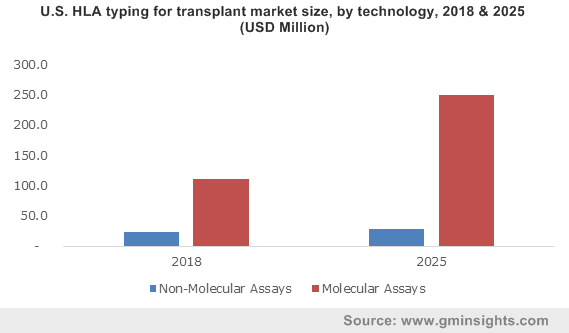 HLA Typing for Transplant Market size was valued over USD 390.0 million in 2018 and is expected to witness more than 11% CAGR from 2019 to 2025. 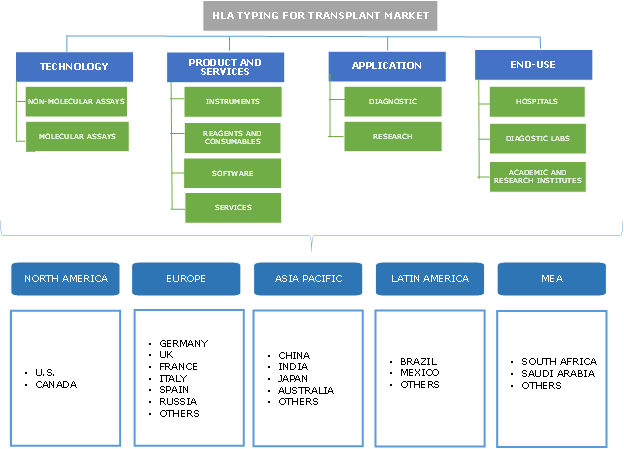 HLA typing for transplant market will witness lucrative growth over the forecast timeframe. Growing demand for solid organ transplants will drive HLA typing for transplant industry growth over the forecast years. These lifesaving transplants are indispensable for treating patients suffering from heart, liver, lung, kidney disorders as they help to increase patient survival. Growing geriatric population will further augment industry expansion as individuals from this stratum are frequently referred for organ transplant procedures due to age or chronic ailment related organ failure. Furthermore, an increasing number of older adults are becoming organ donors. Technological advancements, particularly in molecular assays will further propel growth. For instance, in February 2017, Immucor launched its MIA FORA NGS FLEX HLA typing assay which provides a comprehensive coverage of up to 11 genes. High costs associated with molecular HLA typing for transplant tests limits their adoption. However, several firms and research institutes are engaged in R&D activities for developing solutions with lower cost per sample. For instance, in May 2015, researchers at the University of Kiel in Germany developed an NGS HLA typing test which costs considerably lesser as compared to the existing commercial tests. Introduction and commercialization of such low-cost tests will boost adoption during the forecast years. Furthermore, a significant gap between demand and supply of organ donations resulting in increased patient waiting time is impeding industry expansion. However, increasing awareness levels due to government and non-government organizations’ efforts for educating the masses about the need and importance of organ donations will boost supply during the forecast years. Molecular assays segment is slated to exhibit robust growth over the forecast timeframe owing to the increasing adoption of these tests. Non-molecular methods such as serological assays and mixed lymphocyte culture assays were earlier considered to be gold standard for HLA typing. However, faster and more accurate molecular methods are replacing the non-molecular ones at a rapid pace. Introduction of advanced methods such as next generation sequencing which is capable of processing large amount of sequences in a single run will further propel adoption. Instruments segment held significant industry share in 2016. The large share is attributable to the high cost of the instruments such as sequencing systems which form an essential component of the procedure. Advent of modern technologies have enabled development of instruments that provides better and accurate results in less time. Funding from private players for establishing new diagnostic and research centers will spur instrument demand. Services segment is slated to witness lucrative growth during the forecast period. 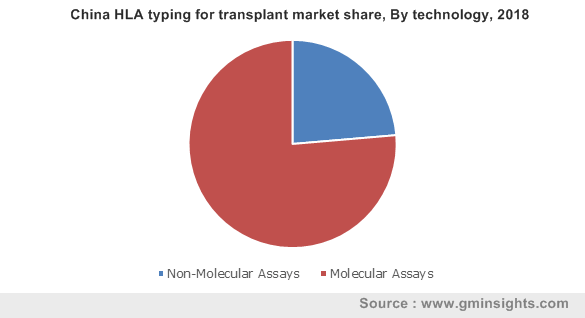 Growing trend of outsourcing HLA typing to third party firms will boost segment growth. Several laboratories outsource their HLA typing work owing to resource scarcity and inability to afford the high-priced instruments. Application of HLA typing in diagnostics held significant industry share in 2016. In diagnostics, the technique is used for matching organ and tissue transplant recipients with compatible donors. Increasing number organ donations and transplantations will fuel segment growth. Application in research is poised to grow at a lucrative rate during the forecast timeframe due to increasing R&D activities for developing new and advanced methods. Hospitals held significant industry share in 2016 as majority of tests and transplants are conducted in these healthcare institutions owing to the availability of highly skilled medical and nursing professionals and advanced medical equipment. Increasing number of patients requiring transplants being admitted in hospitals will further escalate demand. Academic and research institutes end user segment is poised to grow at a lucrative rate owing to the increasing use of HLA tests in various experiments focused on gaining in depth insights for enhancing existing methods and developing new ones. U.S. market held significant industry share in 2016. The large share is attributable to the growing number of organ transplant procedures. Increasing life expectancy and the consequential spur in geriatric population base will further boost industry growth. Increasing HLA typing product approvals from regulatory bodies is leading to availability of advanced products in the region, in turn fostering growth. 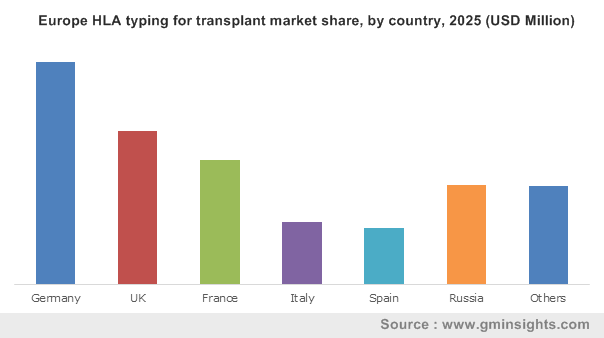 Italy HLA typing for transplant market will witness lucrative growth over the forecast years owing to increasing number of organ donations. Increasing adoption of advanced techniques, such as implanting of single liver into two patients will further escalate demand. Notable industry participants include Pacific Biosciences of California, Thermo Fischer Scientific, Immucor, Illumina, GenDx and CareDx. The companies are engaged in rigorous R&D focused on further advancing their existing technologies with an objective of enhancing efficiency and achieving lower costs in testing and laboratory operations. The industry players adopt a strategy of imparting technical knowledge to clinicians and administrators at various treatment and transplant centers for boosting their product sales. Some of the other strategies include product portfolio expansion, acquisitions, partnerships, distributor agreements and collaborations. For instance, in July 2012, Thermo Fischer Scientific acquired One Lambda. The acquisition provided the company access to the lucrative transplant diagnostics market along with an opportunity to leverage its existing global commercial infrastructure for serving the growing transplant needs in emerging markets. The HLA typing for transplant industry is undergoing a paradigm shift from non-molecular to molecular assays with the onset of novel technologies. Various molecular methods such as Sequence Specific Oligonucleotide (SSO), Sequence Specific Primer (SSP) and Sequence Based Typing (SBT) are increasingly being used and new technologies such as NGS are penetrating into the market. At present, few industry players offer advanced solutions; however, the industry rivalry is set to intensify over the forecast timeframe as prominent molecular biology and immunogenetics firms venture into this space.